EXECUTIVE OFFICES NEW YORK 66 West 35TH ST.
GENERAL OFFICES BALTIMORE,MD. 213 COURTLAND ST. BRANCH OFFICES GOVANS,MD. SUBURBAN BANK BLDG. REFINERIES and QUARRIES NEAR HARPER’S FERRY W. VA. SHIPPING FACILITIES B. &O.R.R. — C.& O. CANAL CONNECTIONS TO SEA- BOARD AND ALL RAIL ROADS. New York April 12, 1911. Our quarrying and refining progress has been so rapid and our great success is so positively assured that today the Board of Directors has decided to withdraw the 40% Bonus of Common stock temporarily given with the Preferred shares of the Potomac Refining Company. 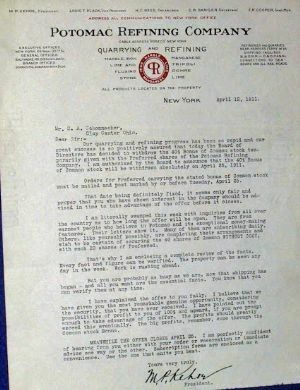 I am authorized by the Board to announce that the 40% Bonus of Common stock will be withdrawn absolutely on April 25, 1911. Orders for Preferred carrying the stated bonus of Common stock must be mailed and post marked by or before Tuesday, April 25. That date being definitely fixed, it seems only fair and proper that you who have shown interest in the Company should be advised in time to take advantage of the offer before it closes. I am literally swamped this week with inquiries from all over the country as to how long the offer will be open. They are from earnest people who believe in Potomac and its exceptional money-making features. Their letters show it. Many of them are subscribing daily. Others, like yourself possibly, are completing their arrangements and wish to be certain of securing the 40 shares of Common WITHOUT COST, with each 20 shares of Preferred. That’s why I am enclosing a complete review of the facts. Every fact and figure can be verified. The property can be seen any day in the week. Work is rushing ahead. But you are probably as busy as we are, now that shipping has begun and all you want are the essential facts. You know that you can verify them at any time. I have explained the offer to you fully. I believe that we have given you the most remarkable genuine opportunity, considering the security, that you have ever received. I have pointed out the possibilities of profit to you of 100% and upward, if you are prompt enough to take advantage of the offer. The profits should greatly exceed this eventually. The big profits, remember, come through the Common stock Bonus. MEANWHILE THE OFFER CLOSES APRIL 25. I am perfectly confident of hearing from you either with your order or reservation or immediate advice one way or the other. Subscription forms are enclosed as a convenience. Use the one that suits you best.